Saloma Theatre Restaurant sous chef Dzulkarnain @ Jol Salleh hails from a small fishing village, hunting squid in Kuching, Sarawak and is the youngest of seven siblings. His father was a fisherman while his mother was a housewife who taught all her children to cook. His mother often combined several kinds of seafood, caught by his father, to create a dish including this dish which combines fish, prawn and squid. It is easy to prepare and the ingredients are easily available. It makes a great dish for the upcoming Hari Raya celebrations. The percik sauce has red chilli in it but it is not spicy. He also recommends garoupa or red snapper fish in place of the dory fish. Pound dory fish and prawn together into a paste until fine. Add a pinch of salt, sliced carrot and red chillies in the paste and mix well. Squeeze the paste into the squids and ensure it is compact. Pierce a toothpick through the open end of the squid to close it. Steam for 20 minutes. For percik sauce: Blend garlic, shallots, chillies, black pepper, white pepper, kaffir leaves and lemongrass together. Pour in some cooking oil into a sauce pan and add in the blended ingredients. Stir the ingredients until fragrant. Add coconut milk and turmeric powder and stir evenly. Add some sugar and salt for taste. 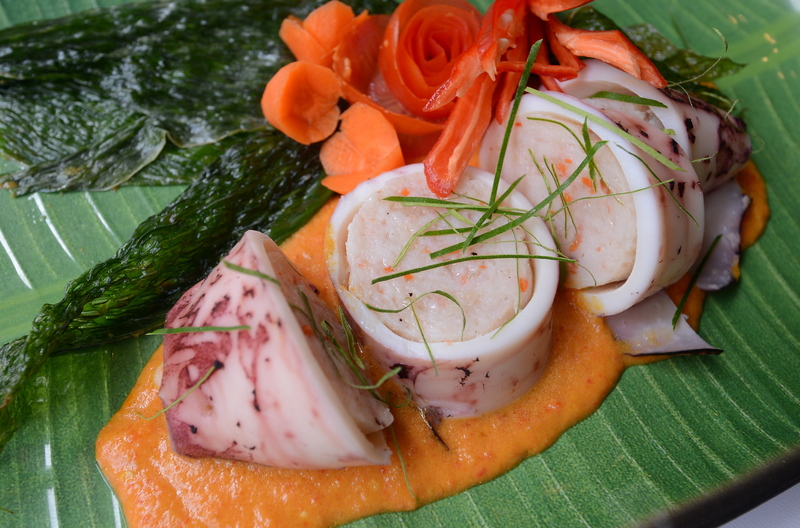 Cut the steamed squid horizontally and place it on a plate. Then pour percik sauce on the squid and serve.